Although I have a number of stories to post and have a few articles started, I continue to look for coins for various reasons. Sure, some of the coins I find are not part of a collection I am working on. But there are a few that when they appear in my pocket change get stored in my desktop bank. After buying lunch, the changed included four cents. When she handed the change, I looked into my hand and noticed three very shiny, red Lincoln cents and one very brown cent. 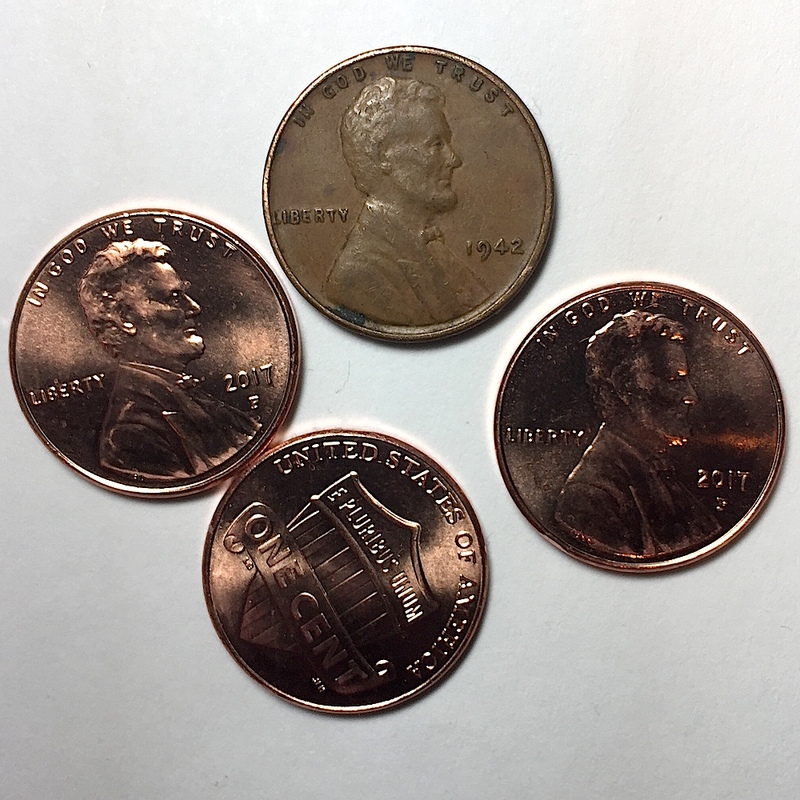 A quick glance of the red cents showed three 2017-P Lincoln cents. These are the new, one-year issue Lincoln cents with the P mintmark honoring the 225th anniversary of the U.S. Mint. For the brown cent, I had to stop a moment and turn it into the light to see it closer. The first thing I noticed is the wheat ears reverse. Nowadays, to find a wheat back cent almost as rare as finding a pre-1965 coin in change. A quick flip and an adjustment of the bifocals reveals it is from 1942, a coin still rattling around in circulation for 75 years. 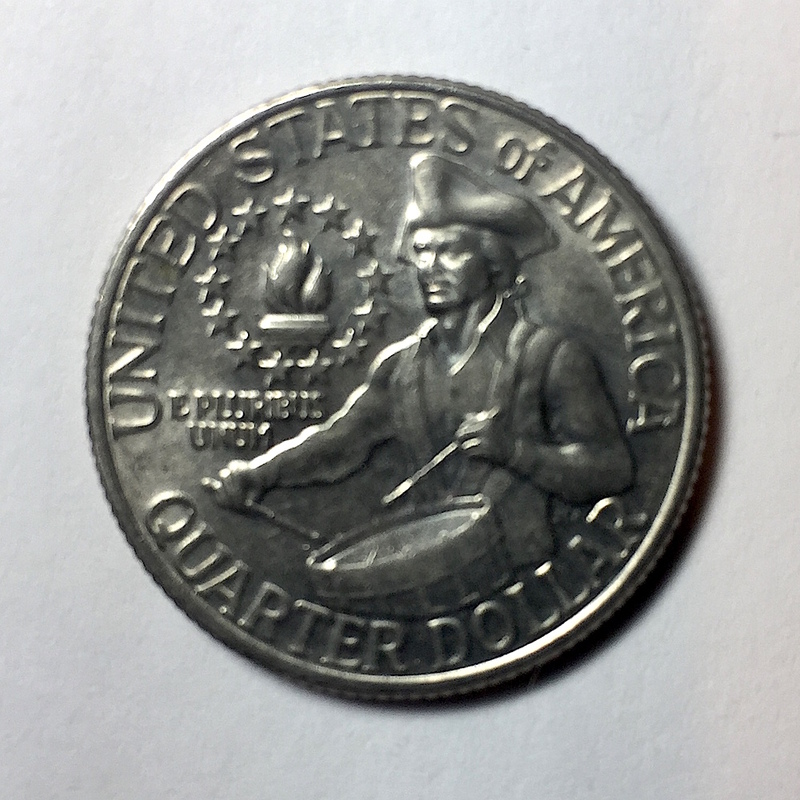 While marveling about finding a wheat back cent, I move some of the other change around and noticed the distinct Drummer Boy reverse of at 1976 Washington quarter. Although there have been quite a few new designs over the last 20 years with all of the different programs, I still reach back to the 1976 Drummer Boy reverse as my favorite modern circulating coin design. The wheatie and the Drummer Boy quarter have been dropped in my special bank. As for the 2017-P cents, they will go back into circulation for someone else to enjoy. I really like the idea of having a special bank. Probably going to borrow that.